My husband and I were having lunch at one of my favorite eateries in Georgetown: Thomas Café on Front Street. I love this quaint little diner. Although the restaurant is usually full of locals and tourists, this morning, however, it was littered with only locals. We popped in to find Virginia, a regular, as the only dine-in customer sitting in the back at her favorite antique wooden booth. Chrissy Thompson was just leaving from picking up a take-out order as we came in. We spoke briefly about my new granddaughter and, also, my new post as a columnist for GAB News. We did wish each other a good day as we seated ourselves in the corner at a table for two followed by greeting the waitresses, Livvy and Des (not to be interchanged with Desi). We asked after Kelly, another waitress who is currently out on medical leave. “She’s doing a little better,” Livvy answered and talked some on how her leg is mending. “Where’s Ashley?” I asked and noted that for the last few visits to Thomas’ Ashley has been noticeably absent. “She’s off today,” Livvy stated as she headed back to work. Shortly thereafter, we realized it was 11:00 on the nose because Catherine came in for lunch. Daily, you can find Catherine sitting at her little two-seated table by the lunch counter between the hours of 11-2 pm. All of the locals who come in to eat know that is her table. Barry Price and his wife followed in behind Catherine. As Barry and I discussed my possibly doing an interview with him for the Meet Georgetown segment of my blog, it dawned on me how much of a home-style local hangout Thomas Café is. It has such a casual and laid-back atmosphere that I thought nothing of offering him some of our onion rings and likewise, he thought nothing of it, either. It’s just something you do in polite company at Thomas’. I was reveling in the simplicity of this nostalgic restaurant when Phil Brady came in and sat at the table next to us. Phil is one of my favorite subjects. I realized I left my camera at home when I went to snap my usual picture of him. I almost always take a picture of Phil whenever we bump into one another in town. “Who?” Phil and I both asked in unison. “You – Phil,” Barry said with a motion in Phil’s direction. “I’ve already written about Phil,” I replied. “I wrote about Phil a long time ago. Phil and I chatted a few minutes about his next magic adventure. Being a local talent, he likes to travel (by train or car) to different magic events and perform. 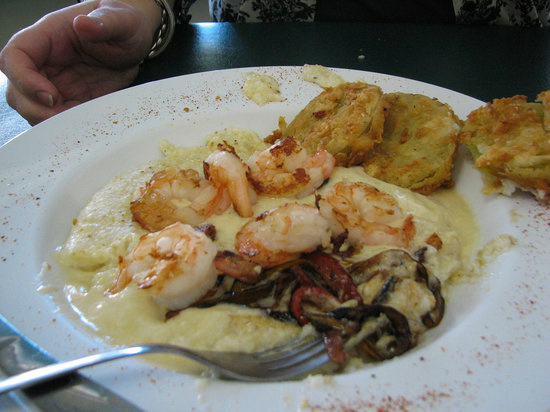 Thomas Café is known for their Shrimp N’ Grits with a side of Southern Fried Green Tomatoes. That just happened to be what I ordered for lunch. As I was about to dive in, I turned to our table-neighbor and asked about his next show. We all talked to each other without haste or worry and just enjoyed our lunch together like one would in a home filled with old friends. As we were finishing up our meal, I sat back and, again, thought about the simplicity of this restaurant. Yes, it’s absolutely lost in time, but that’s part of its charm, its allure: the simple nostalgic era of the early twentieth century. How wonderfully and beautifully amazing this place is, Thomas Café.